Jacques Lacan argued that artists move ahead of analysts. Why? Because of the artist’s know-how [savoir faire] concerning the void, das Ding. Like the potter, not only does he know how to create a new esthetic form, but also, and more importantly, how to get organized around the void, which is impossible to fill. That’s the secret of creation. Art implies the sublimation of the drive and the ability to read contemporary symptoms. “Time life” is the name of Christian Boltanski’s latest exhibition at the Israel Museum in Jerusalem. It is a retrospective covering thirty years of his creation. The concept of time and its relation to life seems to be at the center of the exhibition. Boltanski says: “Central to my work is the fact that each one of us is unique and important and, at the same time, is destined to disappear. Most of us will be forgotten within two generations, after those who knew us have passed away.” It seems that by his work he is trying to perpetuate the time of memory in such a way that human life will not be forgotten. For instance, he is creating an archive of telephone directories from a time span of fifty years, undoubtedly to emphasize the place of memory or of recording an archive of heartbeats. Those archives play the same role as the reading of names of loved ones, relatives, those murdered in wars, which in Israel, has become the act of remembrance titled: “Each person has a name.” This takes place annually during the Shoah commemoration day. Names instead of numbers, heartbeats instead of corpses. One section of the exhibition is bordered by two big illuminated signs: “Depart” and “Arrive”, and we may certainly ask ourselves to what those signs are related? To life? Or something else? This section includes some details concerning the Shoah, death, accentuating memory’s place, but we can also look at it as an invitation to an introspective gaze. 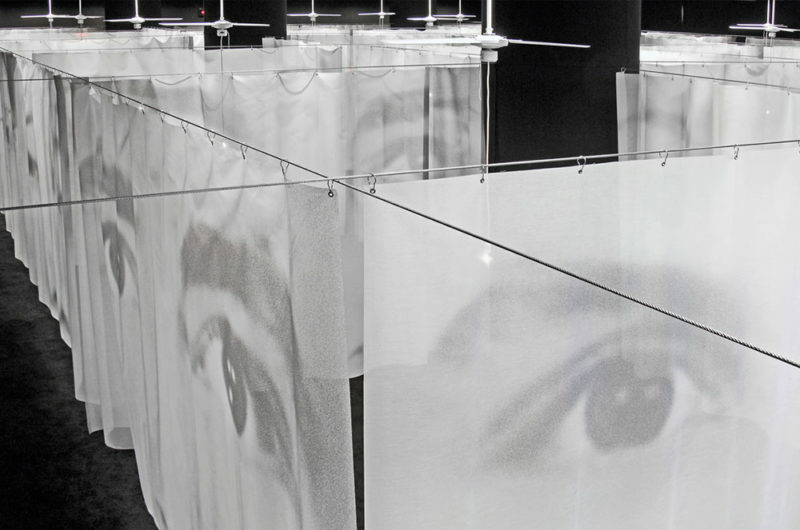 A sort of labyrinth built by white transparent curtains leading the spectator to an encounter with eyes, black eyes, black holes as eyes, in other words, with the gaze. Our very gaze at life and death is reflected in those white curtains. The itinerary ends with a second encounter, this time with a big golden heap, about five meters high, made of hypothermia-survival blankets. The oeuvre transforms the big heaps of used clothes or shoes from Nazi camps, which Boltanski has presented in another exhibition, into a survival heap. From calamity to hope, to the possibility of another beginning. This extraordinary exhibition echoes Freud’s idea: “Si vis vitam, para mortem” – if you want to endure life, prepare yourself for death (SE14, p. 300), taking into account time’s life.